I did become a little concerned though. I have had this nagging pain on the ball of my left foot, that has driven me a bit bonkers, as of lately. With the marathon coming up so soon, I worried about over-use. In looking at my training, my long mileage days have been right up around the 20 mile mark several times. Usually most training schedules have you doing a 20 mile training run ONCE, three weeks out from the actual marathon race. I would have another 20 miler this Saturday, but something was telling me that I needed to find out if I was going to kill my stamina for the actual event. I hopped on Hal Higdon‘s Face book page and posed the question. I figured that if anyone knew the answer, he sure would! 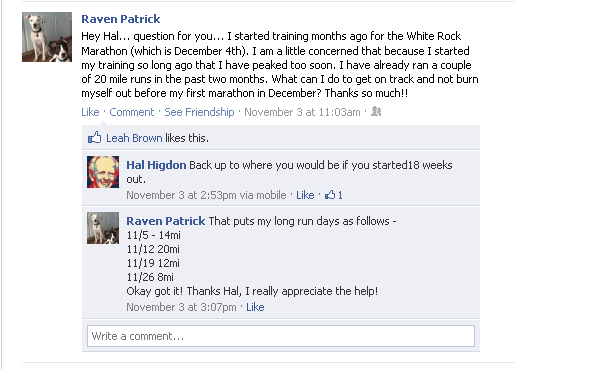 His training schedules are the backbone of most, if not all Marathon training. That settled it; cut back to a 14 mile run on Saturday, and then do ONE more 20 mile run the next Saturday; after that begin to taper, until race day! This entry was posted in How to Tidbits, Running the Rock, Running Wellness and tagged dallas, Hal Higdon, Health, injury, Katy Trail, marathon, marathon training, running, white rock marathon by Raven. Bookmark the permalink.